Set consists of 32oz Lakewood Organic Tart Cherry Blend and 32oz Lakewood Organic Lemon-Ginger with Echinacea. 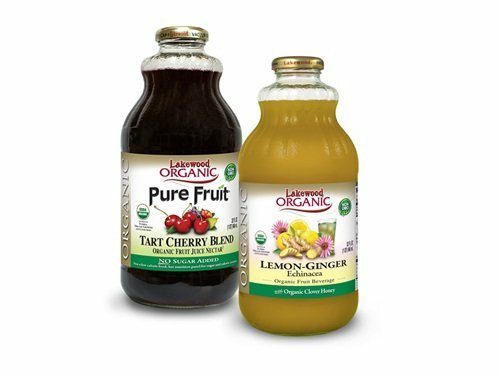 Lakewood Organic Tart Cherry Blend is fresh pressed from 100% fresh fruit. Helps to promote relaxation, healthy sleep patterns, maintain normal cholesterol level, support a healthy urinary tract and restore vital body electrolytes and immune system. Lakewood Organic Lemon-Ginger with Echinacea contains fresh pressed lemon juice blended with Echinacea, ginger root and honey. Juice helps to support a good immune system, overall health, helps to restore vital body electrolytes and support metabolism. Both Lakewood juices are sugar free and does not contain any artificial colourings, sweeteners or flavours. 100 % Organic USDA Certified From Miami, Florida, USA.